On a built-up street in an urban area just inside the M25, you’ll find a new Scandia-Hus timber frame home. But you’ll have to look carefully, otherwise you might miss it. The design fits so effortlessly into the scene of the road, you would think it’s been there for as long as the neighbouring Victorian properties. 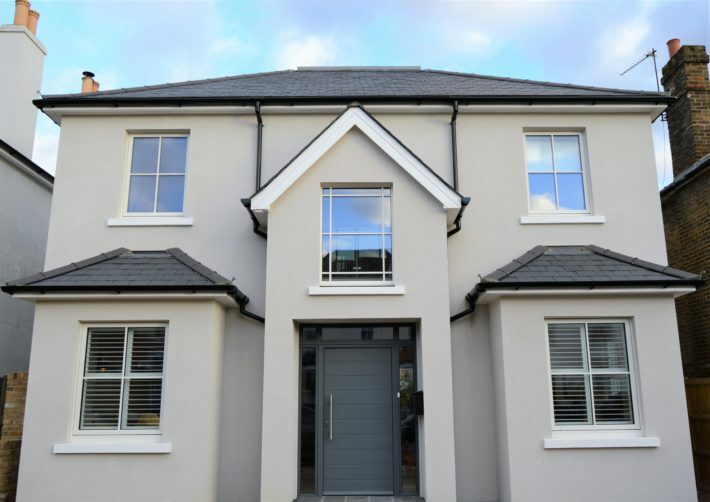 In fact this high specification build was only finished in November 2017, over 100 years after most of the homes in the vicinity, having taken a short 9 months to complete. The transformation from disused garden plot is an interesting story; the couple who embarked on the project, Geoff and Chris Howes, had lived next door to the site for over 32 years. The land on which the new home was built actually formed part of their garden at no.5, as well as some of no.9’s, there (oddly) being no property at no.7. An opportunity arose to purchase their neighbour’s share of the plot and, after looking at the finances, decided it was an ideal time (and place) to create a new home for themselves. 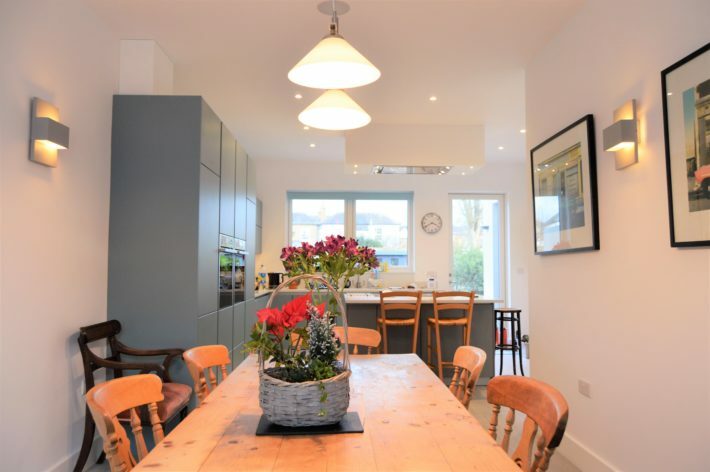 The couple had previously discussed their potential next move and had agreed a modern house, with its warmth and contemporary finishes, would be the best option for them. So, when the land became available they put their property on the market and began to plan their dream home. Initially Geoff liked the idea of a Scandinavian look, having recently returned from a trip there. He found the modern chalet style homes very attractive, with the abundance of glass and sloping roofs, and used this to start his research, which is how he came across Scandia-Hus. The Howes visited Grand Designs Live after receiving complementary tickets from the Scandia team, and met with Project Manager Cameron McMillan. A site visit and a walkthrough of Scandia’s contemporary show home followed, with initial plans being drawn up by the in-house architectural designers. Unfortunately, the planners had a number of objections and the application was refused. Cameron and the Scandia architectural team adjusted the design to address the local council’s criticisms; a 2 metre gap between neighbouring properties was included as requested, the roofline adapted and windows changed to a sliding sash style so that the house better reflected the look of the street scene. The amended application was approved, and groundworks began in March 2017. The timber frame building set was delivered around Easter time and in 11 days the shell had been erected. The main contractor, a company who have a history of building Scandia-Hus properties, project managed for the clients, allowing them to enjoy choosing the internal look, fixtures and finishes, without the stress and responsibility of organising everything themselves. The couple, who were renting a nearby flat, visited site most days to check on progress, and were able to see their dream home swiftly become a reality. 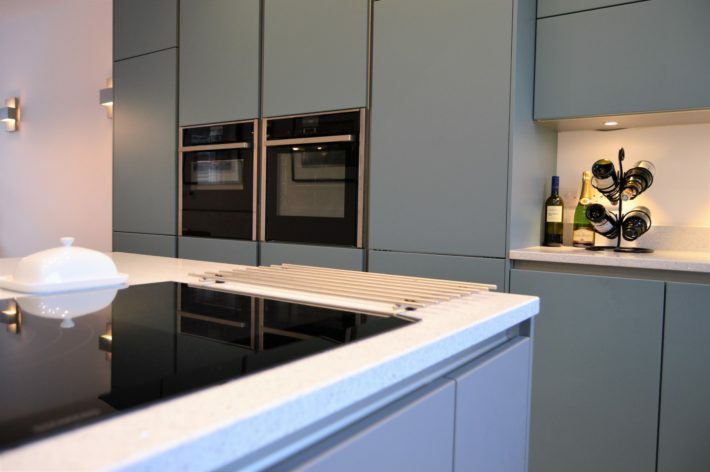 Towards the end of the year they moved in, enabling them to host holiday celebrations for their family in the new open plan kitchen / dining room. 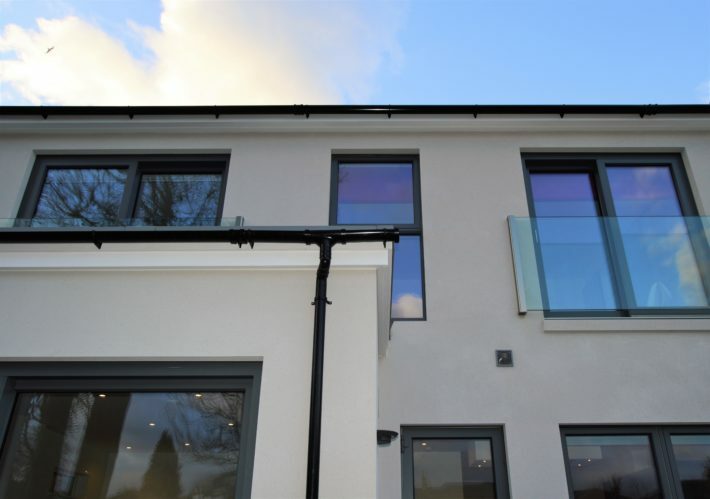 Although the look of the property is clearly reflective of the traditional houses that surround it, inside the couple wanted a more contemporary feel. The living area benefits from clerestory windows, a rooflight and sliding doors, which floods the space with natural light, despite the built-up location. There’s also a downstairs utility/WC and office on the ground floor level. The feature staircase, with its open treads and glass banister, lead up to a galleried landing on the first floor. 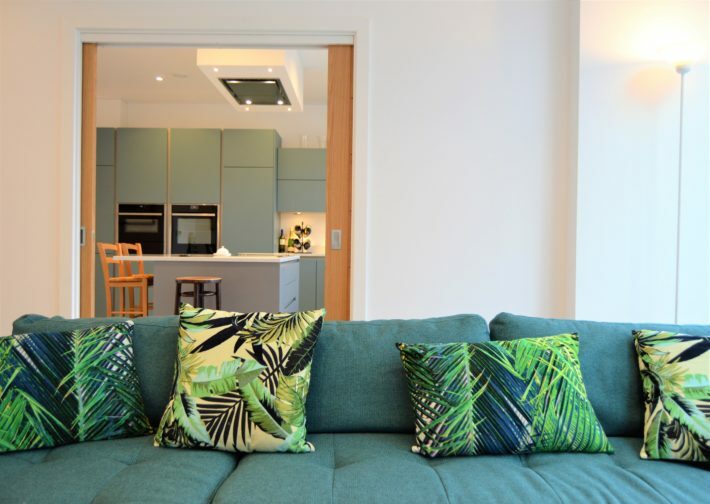 A large family bathroom is situated at the front along with an upstairs lounge area, whilst to the rear there are two generously sized bedrooms, both of which include sliding doors and Juliet balconies, affording beautiful views of the long garden. The couple describe the process as having gone smoothly, despite the difficulties that come with building on a tight site in an urbanized area, and after living in a draughty property for so long, the couple really notice the difference in temperature and comfort of their airtight, triple glazed Scandia Hus home. The Howes are very happy they made the move…2 metres to the left of their old house. 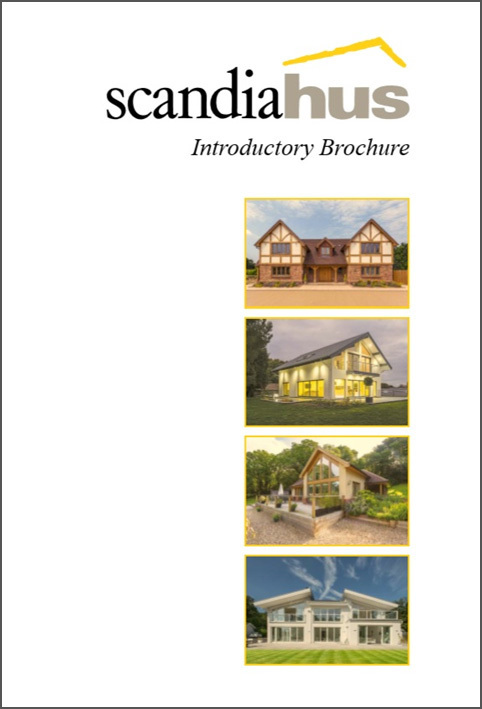 To see this beautiful timber frame home come to life, from plot of land to family home in a few minutes, please click here.